This is the third chapter in the Little Black Book of Scams. Scammers are always on the lookout to collect or reproduce your personal information to commit fraud. Thieves can make purchases using your accounts, obtain passports, receive government benefits, apply for loans, and more. This could turn your life upside down. 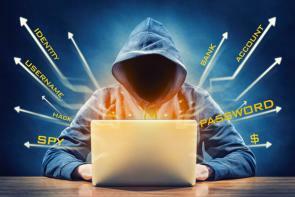 Fraudsters use techniques that range from unsophisticated to elaborate. Offline, they can go through trash bins or steal mail. Online, they can use spyware and viruses, as well as hacking and phishing. They look for credit card information, bank account details, full name and signature, date of birth, full address, mother’s maiden name, online usernames and passwords, driver’s licence number, and passport number. Identity theft is a serious crime! For more information refer to page 18. ✔ Never provide your personal information over the phone, via text message, email or the internet. ✔ Avoid public computers or Wi-Fi hotspots, such as in coffee shops, to access or provide personal information; they put you at risk. ✔ Create strong and unique passwords for each of your online accounts. Password-protect your devices and home Wi-Fi network. ✔ Use 2 Factor Authentication. ✔ Update your computer operating system. ✔ Use a secure and reputable payment service when buying online - look for a URL starting with “https” and a closed padlock symbol. ✔ Avoid giving out personal information on social media. It can be used along with your pictures to commit fraud. ✔ Always shield your PIN when using your card. If you hand it over to a cashier, never lose sight of it. ✔ Shred and destroy documents with personal information. ✔ Protect your mobile phones. Contact the Police and IDCare. • Contact your local police and file a report. • Contact your bank or financial institution and credit card company. • Contact the 3 credit reporting companies and place a fraud alert on your credit reports. Always report identity theft and fraud.